In its pursuit to provide the best learning opportunities to the students, now GLBajaj Institute has joined has with ICTAcademy. ICT Academy is an initiative of the Government of India in collaboration with the state Governments and Industries. ICT Academy is a not-for-profit society, the first of its kind pioneer venture under the Public-Private-Partnership (PPP) model that endeavors to train the higher education teachers and students thereby exercises on developing the next generation teachers and industry ready students. 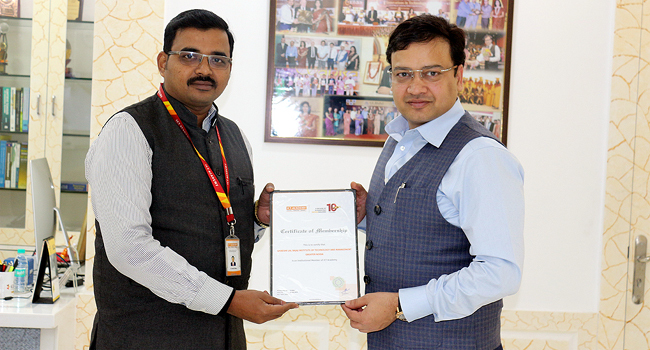 ICT Academy is recently endorsed and recommended by NITI Aayog (National Institution for Transforming India Aayog), the National Planning body of Government of India as one of the unique organization for dissemination and replication, which is aligned to the Skill India Vision of the Government of India. Faculty Development Programs and seminars in both Technical and non-technical fields. Free copies of ICT Academy’s peer reviewed international journals . Free Software, Tools, Training & Assessment from ICT ACADEMY Technology Partners like Oracle Academy, Amazon Web Service ,etc. Supporting International / National Conferences – (All Disciplines, according to the scope of ICT Academy) ICT ACADEMY will support the colleges in bringing Experts and Professionals from Academia and Corporate to enable the colleges to get the relevant resources according to the conference titles.